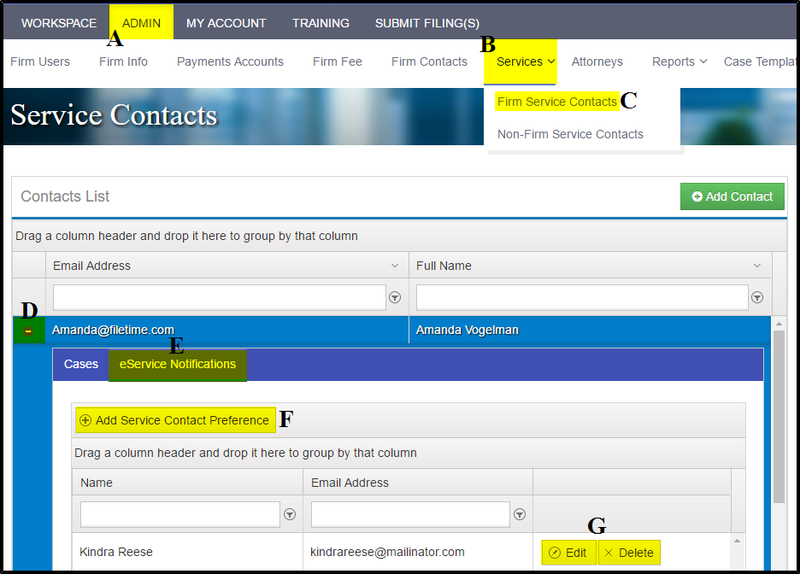 In FileTime, Firm eFiling Administrators can add an unlimited number of recipients to receive additional copies of eService notifications sent to case service contacts. Click the Admin button (A). If you do not see an Admin button you are not a firm eFiling administrator and will not be able to perform this task. Click the down arrow to the right of the Service Contacts button (B) on the sub-menu. Click Firm Service Contacts on the drop-down menu (C) and you are taken to the Service Contacts page. Find the service contact you have in mind and click the + sign in the far left column so it becomes a - (D). The Service Contact tabs open. Click the eService Notifications tab (E). Any names displayed in the grid will be sent copies of eService Notifications sent to this service contact. Click the +Add Service Contact Preference button (F) to add recipients to this list. You can Edit and Delete recipients by clicking the respective buttons for this purpose (G). Filers can also add additional eService Notifications recipients themselves.